Bruce Lee studied profound philosophers, both past & present. One such philosopher, was Dr Napoleon Hill (26 Oct 1883 – 8 Nov 1970), who wrote the bestseller book ‘Think & Grow Rich’. He presented the idea of a “Definite Major Purpose” or “Chief Definite Aim” as a challenge to his readers in order to make them ask themselves, “In what do I truly believe?” According to Hill, 98% of people had few or no firm beliefs, and this alone put true success firmly out of their reach. 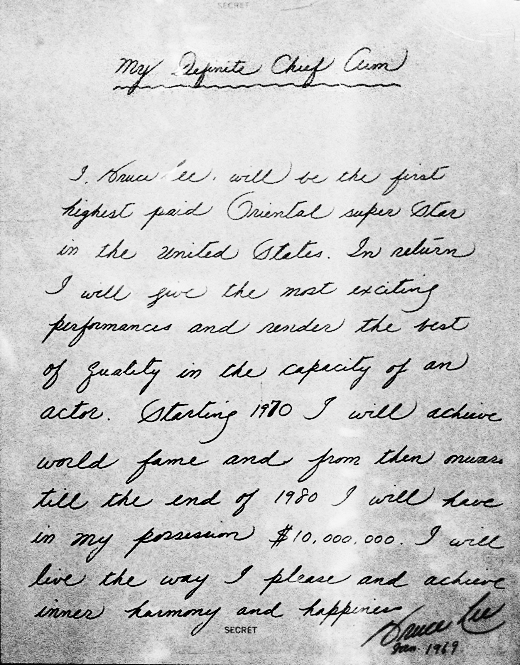 Bruce wrote the following “Chief Definite Aim” — at which time Bruce would have been 28 years of age and a minor TV star in the United States, having featured in a number of shows which included, most notably, the ill-fated Green Hornet series. With his second child recently born and no financial security to speak of, the clearly determined founder of Jeet Kune Do decided to put his “Definite Chief Aim” down on paper. Bruce Lee died on 20 July 1973 at the young age of 32 years, 2 weeks before the release of his blockbuster movie ‘Enter the Dragon’. After Bruce’s death, ‘Enter the Dragon’ catapulted Bruce Lee into a superstar, not only in the USA, but worldwide. 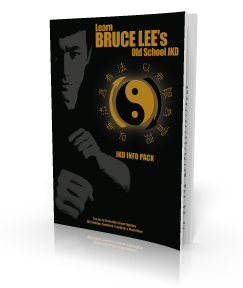 His exciting performances are revered today as the pinnacle of martial artistry, and Bruce’s legend and martial art Jeet Kune Do inspires millions worldwide. ‘Enter the Dragon’ grossed over $25 million in the US alone, so it’s probably safe to assume that the Bruce Lee Estate has exceeded £10 million in revenues. As for inner peace and harmony, I personally feel that Bruce’s fame would have bought him unrest on Earth. Chillingly, I feel that his passing dealt him the ‘inner harmony and happiness’ that he longed, but in another universe. Napoleon Hill was born in 1883 in a one-room cabin on the Pound River in Wise County, Virginia. He began his writing career at age 13 as a “mountain reporter” for small town newspapers and went on to become America’s most beloved motivational author. Hill passed away in November 1970 after a long and successful career writing, teaching, and lecturing about the principles of success. His work stands as a monument to individual achievement and is the cornerstone of modern motivation. His book, Think and Grow Rich, is the all time bestseller in the field. Hill established the Foundation as a nonprofit educational institution whose mission is to perpetuate his philosophy of leadership, self-motivation, and individual achievement. His books, audio cassettes, videotapes, and other motivational products are made available to you as a service of the Foundation so that you may build your own library of personal achievement materials… and help you acquire financial wealth and the true riches of life.